Replaces ISBN 9781908684288. Verbal reasoning skills are at the heart of 11 plus and Common Entrance exams, such as those set by the Centre for Evaluation and Monitoring (CEM), compiled by Durham University. The verbal reasoning section of these exams typically contains questions requiring a good understanding of synonyms, antonyms, homonyms and word definitions. One common style of question is a cloze test, which requires the candidate to correctly complete a passage from which some words have been wholly or partially removed. 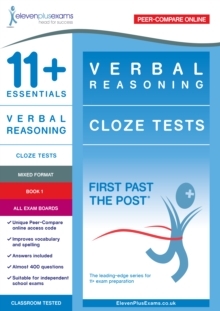 Verbal Reasoning: Cloze Tests aims to develop the skills required to answer cloze questions. This book comprises word bank tests, multiple choice tests and partial-word tests. The online Peer-Compare system helps identify areas for improvement and gauge progress relative to other children taking the same tests. Extensively road-tested by Eleven Plus Exams, all 11+ Essentials tests are best used as real exam practice to strengthen a child's performance. They are perfect for use both in the classroom and at home.